So how did we get on in Gameweek 24? It’s party time up here in TSZ Towers! As celebration for our massive step in the right direction, a huge climb up the FPL ladder, our first green arrow in weeks, we have decided to drink a millilitre of lager for every place we’ve risen! It’s Friday after all. That’s a total of 945 millilitres! That’s a pint and a half between the four of us! We don’t wear ties, but if we did, they’d be wrapped around our heads. Trystan’s just dusted off the karaoke machine, he and Tim are about to do a rousing rendition of Robbie Williams’ Angels. Rob’s gone out to get some plastic cups. I’ve just had a second coffee. Try and stop us! Players invited to our party: Richarlison, Matt Doherty and Pierre-Emerick Aubameyang. That is all. We've been making waves ready for the coming double gameweek that sees Manchester City and Everton play two times for the price of one. 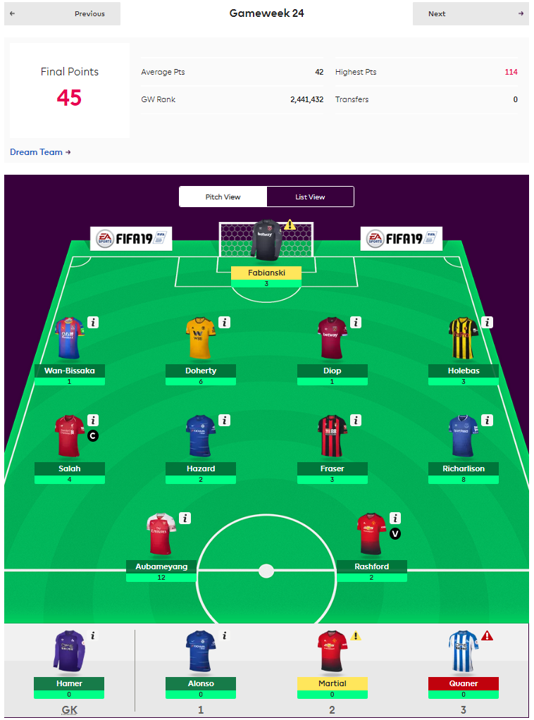 As a large amount of FPL managers have been transferring out Eden Hazard (who's name sounds like a Dutch heavy metal band) for the likes of Raheem Sterling, Leroy Sane and Sergio Aguero, we initially decided to keep him and ditch Anthony Martial instead, to attempt a differential jump up the league. However, after a few minutes of discussion, it was decided that perhaps the majority of FPL managers know best, considering Maurizio Sarri won't even travel home with his Chelsea side anymore. Although I think this is so he can sneak a cigarette on his way to the train station. So Martial, somehow, stays, with Ole Gunnar Solskjaer saying this week that the France international needs to score more "scruffy" goals. We'd like him just to score some goals. Or even just to play in a match. He faces Leicester, who seem to beat the giants and lose to the minnows, so perhaps our United pair may come back to bite us here. It was at this point that Rob suggested we use our wildcard. Even Tim considered it's use sooner, rather than later. Trystan sounded stressed as he pondered how best to say no. Cautious as always, and still the highest ranked player amongst us, he steered the wildcard away, with the view to using it in Gameweek 34. That's a lot of these articles I have to write about how we almost, yet again but not quite, used our wildcard. It took some mulling over, but Sane seemed the more in-form (and cheaper) of the two City wingers, and Aguero simply must feature over Aubameyang. We will come back for you Pierre, probably next week. A ten-minute discussion as to whether we bring in a Silva, Bernardo or David, resulted in, predictably, neither option. With the added exclusion of Sterling, we find ourselves without any of Pep Guardiola's precious metals. Time will tell if we made the sane decision. 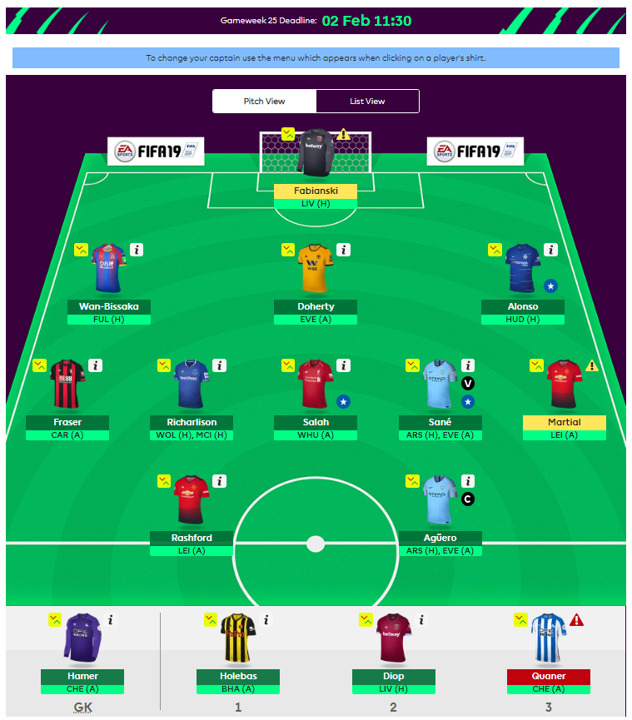 Aguero is captain, Fabianski's doomed... and ladies and gentlemen, Wan-Bissaka plays.